Priscillas: Three More Trees ! Here are the last of the 13 trees ! 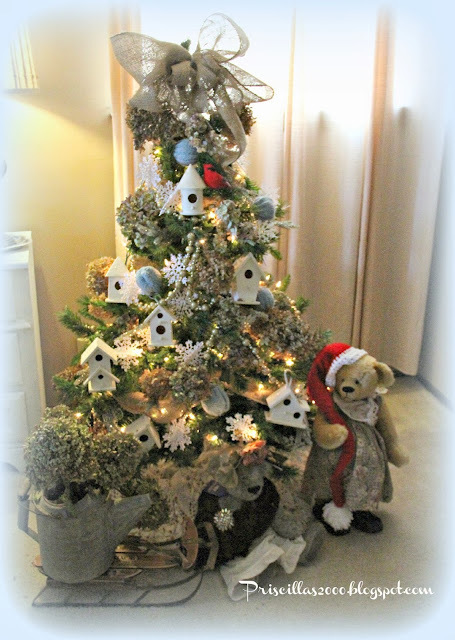 This ice skate tree is in the living room ...It is a 5 ft.skinny tree..Filled with only ice skate ornaments .. 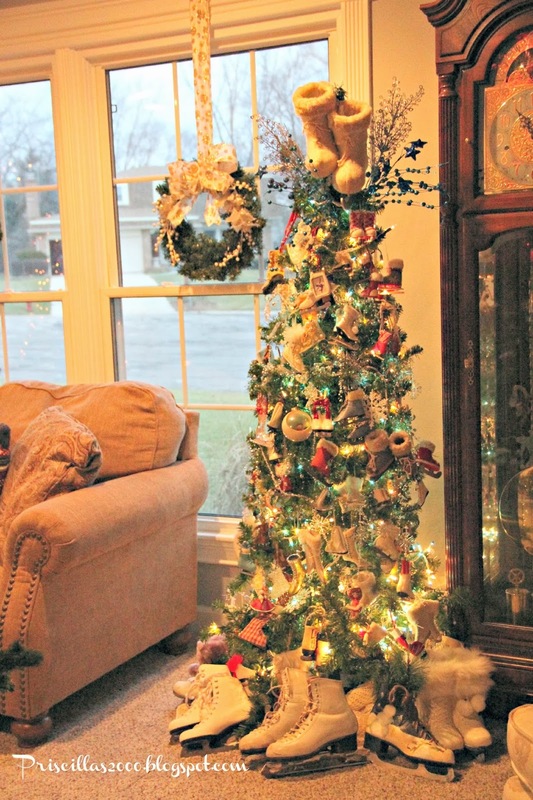 I made the tree topper out of a pair of skates my Connecticut sister in law sent me a couple years ago.. I glued a piece of a roll from a decomesh roll in between them . It slides perfectly over the top branch of the tree.There are blue and white lights on this tree.. Lots of blue whimsical pics sticking out around the topper. I was an ice skater ( a million years ago :) and that's me in the little frame skate .. 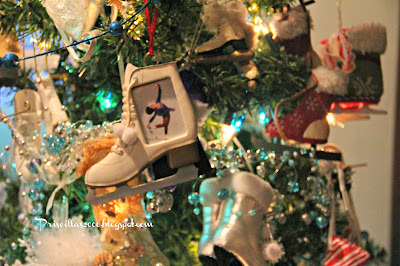 The tree is surrounded by ice skates .. even mine are down there ! 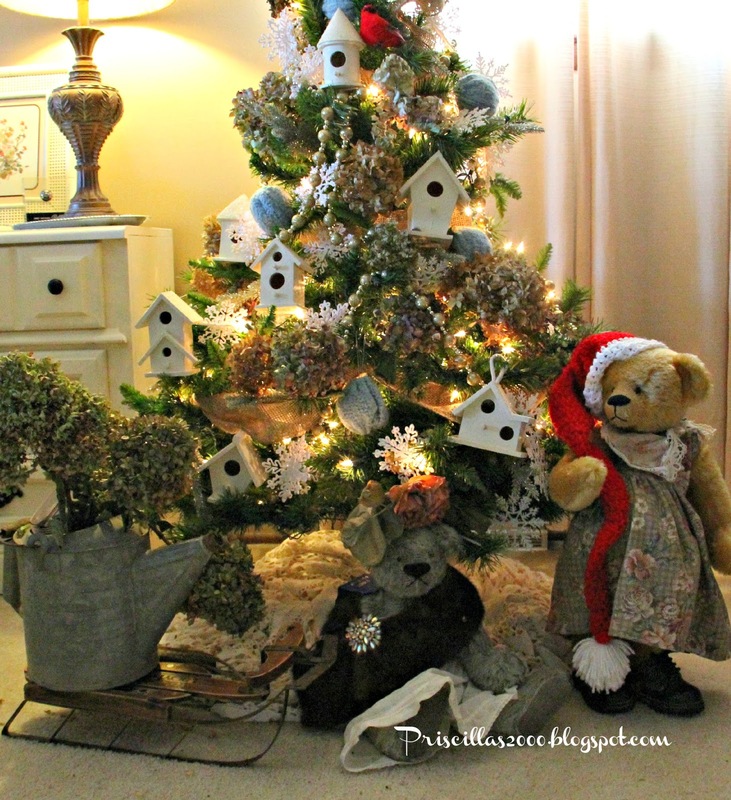 In my master bedroom we have a garden theme tree this year ..Burlap garland and tree topper.. glittered birdhouses, dried hydrangeas from the garden.. snowflakes and sweater ornaments ..I just took some ornaments I wasn't using and used the sleeve of an aqua sweater ..gathered the bottom stuck the ornament in and gathered the top with needle and thread.. you could even tie it on. 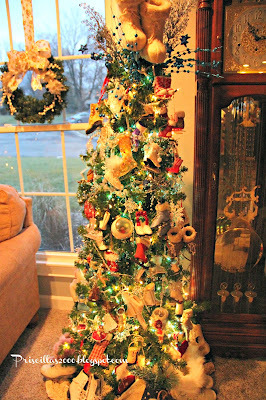 Then if you don't want the sweaters on them anymore you can just snip the threads and back to regular ornaments. 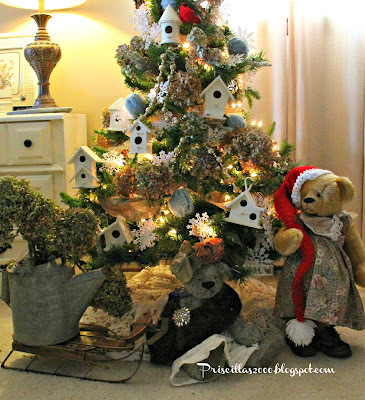 I have a vintage watering can full of more hydrangeas, and a couple mohair bears that I made around the bottom of the tree. The big bear is even wearing my youngest sons shoes from when he was a toddler.. 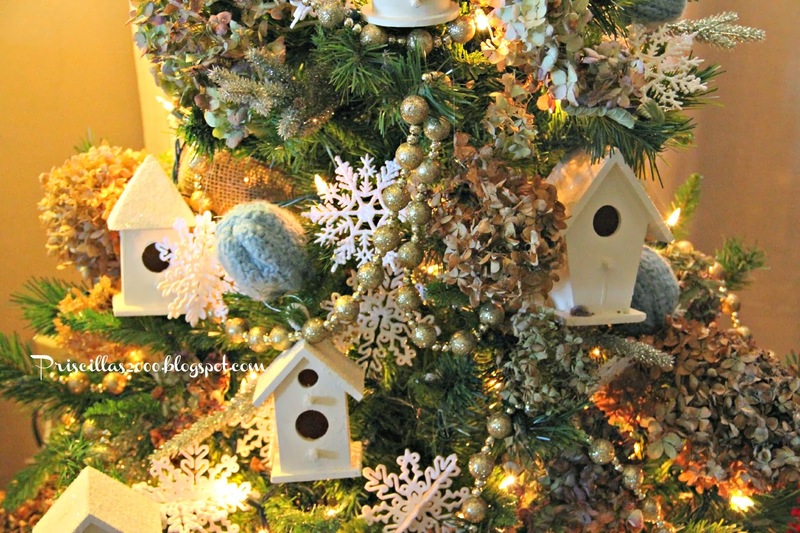 I got the birdhouses at Joann Fabrics and painted them cream and added glitter to the roofs to look like snow. 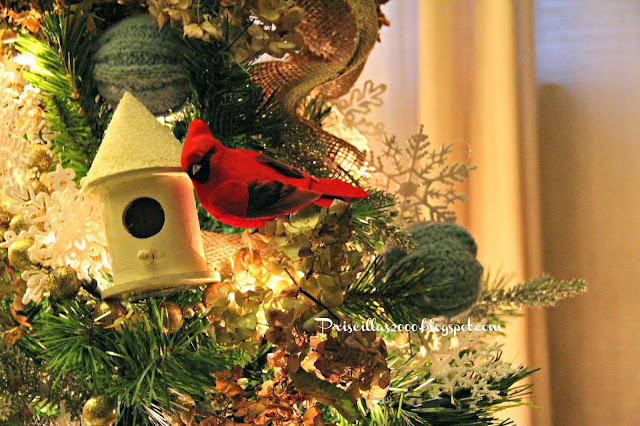 Love the sweater ornaments ! In the Upstairs hallway is the boys tree. The patches that would go on a letterman jacket decorate this tree. 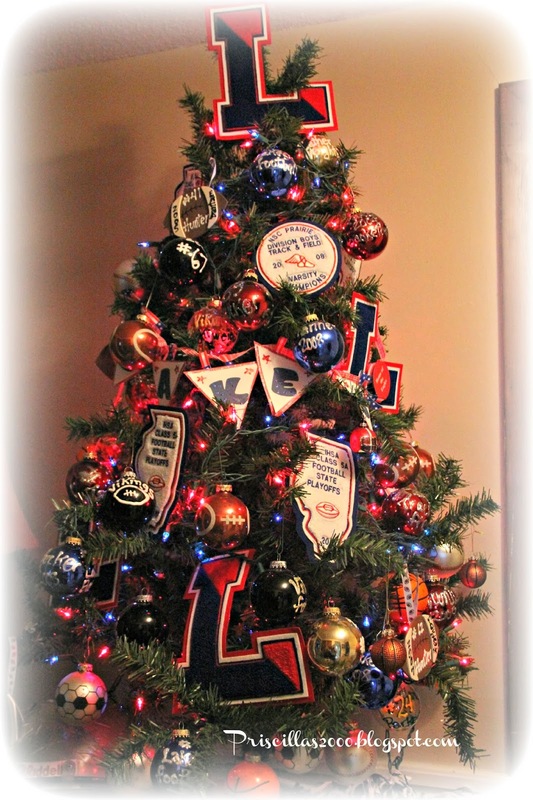 I also made ornaments for every sport they were in , year and # with puffy paint on regular ball ornaments. 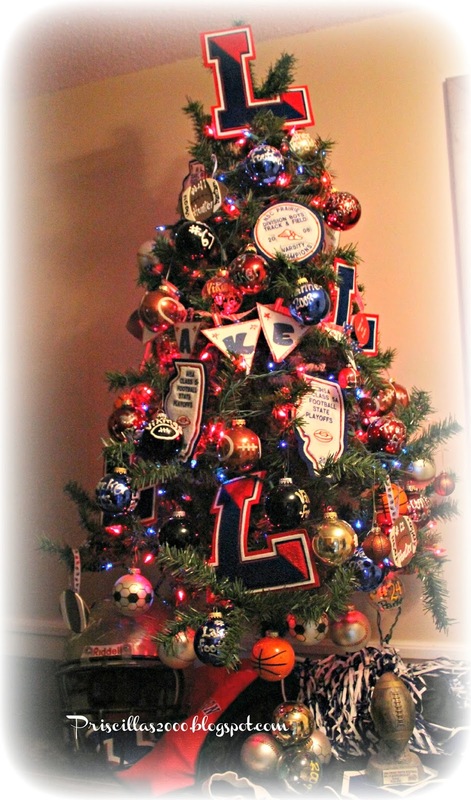 There are also a lot of football, basketball, baseball and soccer ornaments. 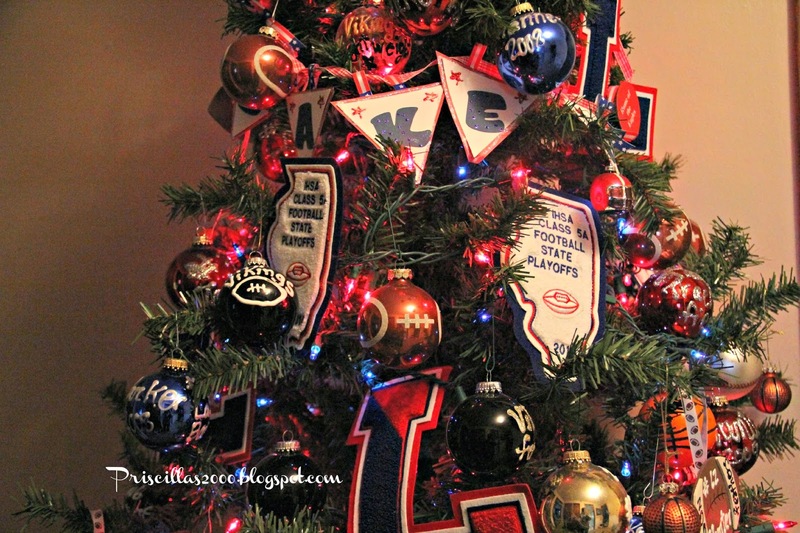 Around the bottom of the tree are a couple of their football jerseys , a helmet, some pom poms from a University of Kentucky game and some of my boys football trophies. Thanks as always for stopping by and your sweet comments ! 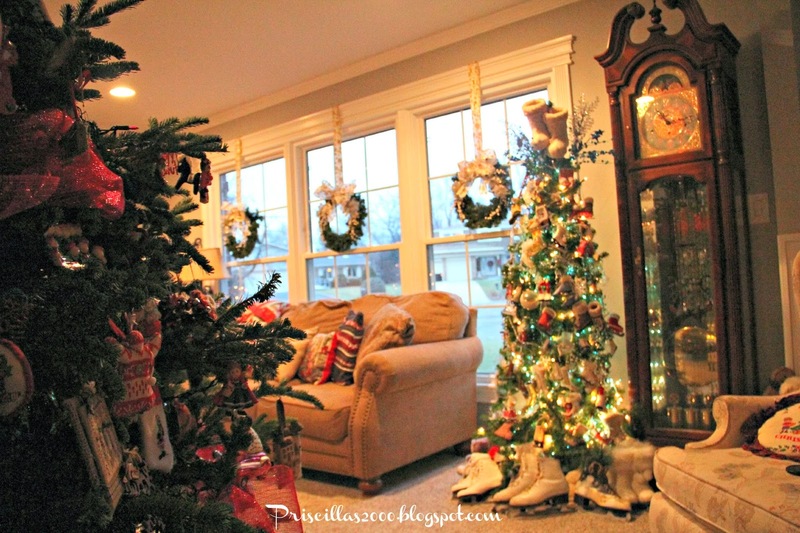 They are fabulous…I had 13 trees last year..and really scaled down this year…you certainly have lots of energy and talent…Beautiful trees!! 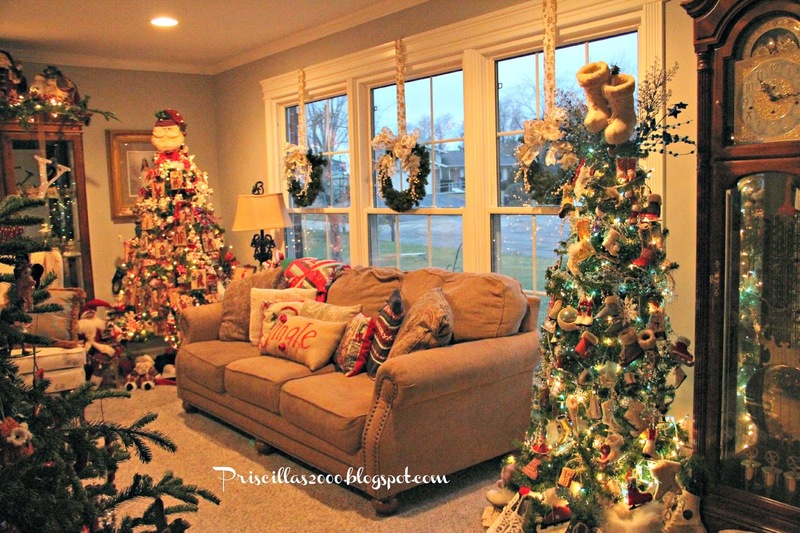 Wow, love the ice skating tree, who knew there were so many ice skating decorations?? 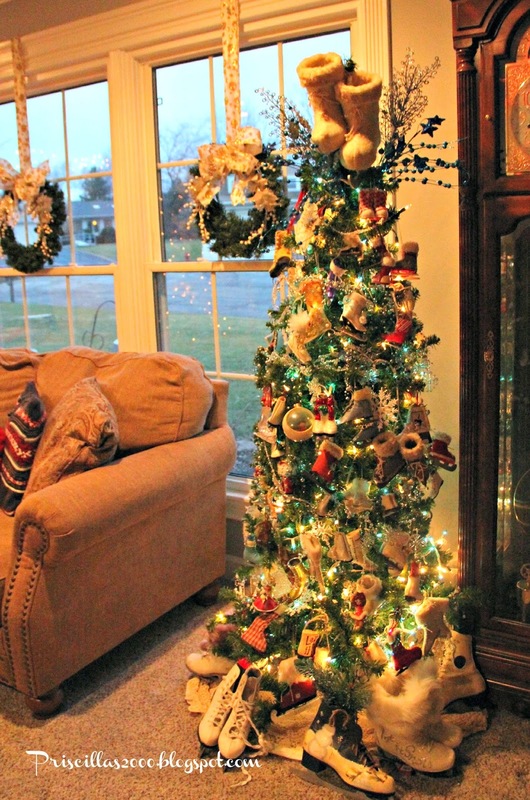 It looks wonderful, as does the garden tree and the boys tree. They are all just brilliant!!! The sports is tree is such a great idea! My boys have a small tree with a few sports themed ornaments, but we will have to try this next year! Thanks for sharing! Beautiful, I don't know how you do it!